Now how do these properties affect the shadow cast by the subject... ? These two videos give you a basic idea of how shadow can be drawn and how the properties affect them. A must see... How to draw shadows and Drawing perspective shadows. 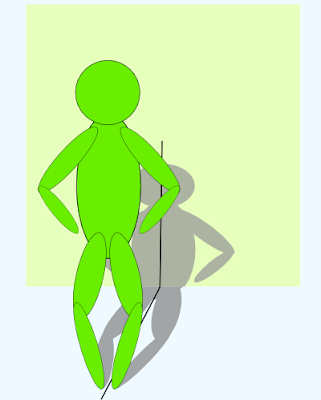 Size of shadow depends on distance between the source of light, object and surface of shadow. The size of the shadow increases as the distance between source of light and object decreases. The shadow appears blurred if either there are many sources of light or if it is far from the subject. 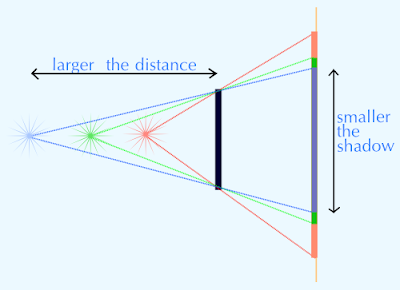 The position(angle) of the source of light decides in which direction the shadow is cast. 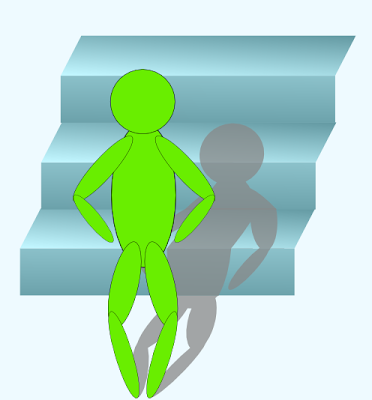 The shape of shadow is also defined by the surface on which shadow is cast. shadow is irregular on irregular surfaces. The 3 dimensional subject is cast as a two dimensional shadow whose shape is defined by the relative position of subject and source. For example see what objects can cast a square shadow and what shadows a cube can cast ... That would give you an idea. 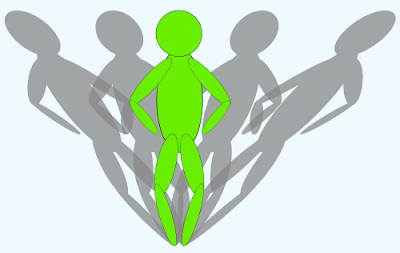 After getting basic idea about shadow, the next point is how do we illustrate a shadow in Inkscape. 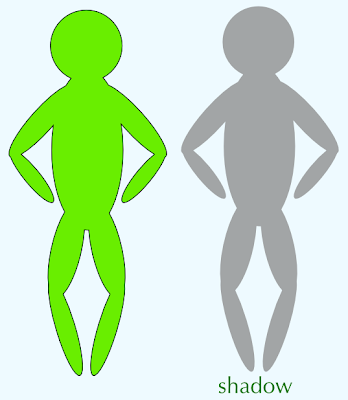 The basic method is duplicate the subject to create the shadow, give it a grey color and decrease its opacity. Then do the transforms like skew, stretch and move. What transforms and how much you need to perform depend on the properties of source of light,subject and surface that you saw earlier. For 2D image editing softwares, the above idea can give good results for flat or simple sjubects. When the subject is a 2D illustration of a complex 3D object some amout of imagination and manual editing of the nodes of shadows is necessary. 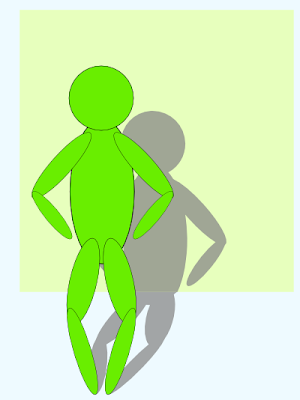 Here is a small how to for illustrating shadow for a human figure. You can apply the technique for other objects also. 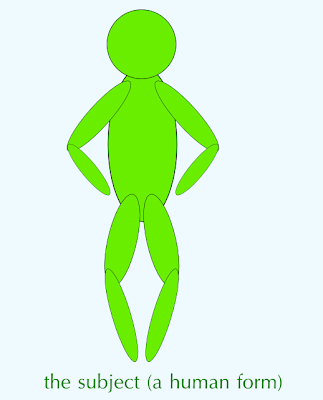 1) Draw ellipses using ellipses tool, rotate and arrange them as above to get a human form. select all the ellipses and do a path->union. give it a grey (888888ff) color fill and 75% opacity. For time being, place the shadow object above the subject. Align(ctrl+shift+a, center along vertical, center along horizontal axes) them both so that they overlap each other completely. Click on the shadow layer twice, you will see the handle for skew operation. Play with the skew operation holding shift key. This will give the angle at which the shadow is formed. Depending on the position of source of light you can settle for a shadow. Now click on the shadow object once, you can see the squeeze or stretch handle. play with this handle. 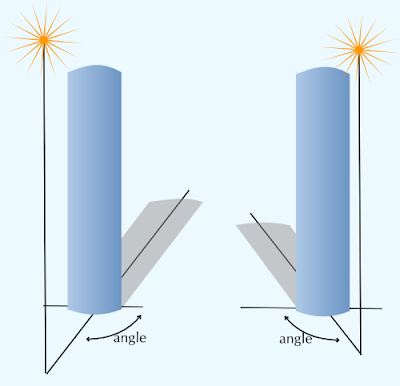 this gives the elevation or the height of the source of light. So now we have a shadow of the object on a flat surface(floor). What if there is a wall some distance behind the man, would the shadow be the same ? lets see how to illustrate that. 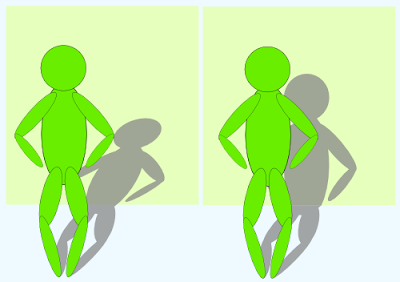 A) Select the shadow and the wall surface and duplicate them. Tthen do a path-->intersection. give this new shadow object the same fill and opacity as that of the shadow. 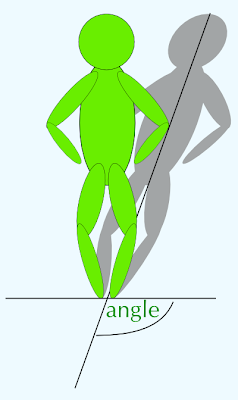 We need to do a skew to the new shadow as we did earlier for angle of shadow, this time the shadow must be vertical as below. 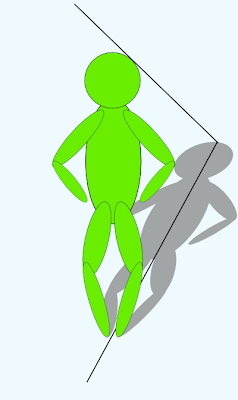 B) The shadow that you got is not a perfect one, we need to do the stretch operation. Decrease the opacity of the wall so that you can see the old shadow. 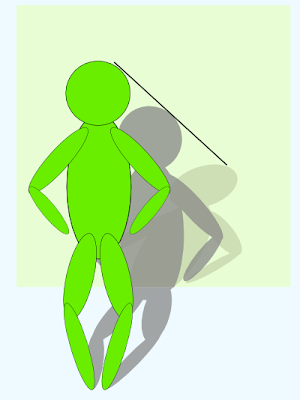 Draw a reference line from the old shadow to the man's head. Now stretch the new shadow as we had done earlier until it touches the reference line. Now reset the opacity of wall and delete the reference line. Applying the same technique you can illustrate shadows on complex surfaces. Here is an example of shadow on steps.